It has been a while since I've written a book review like I did when I read Veronika Decides to Die, by Paulo Coelho, for example. The author has requested if he could publish it on his blog, and that today still makes me beam with joy even though it had happened in 2007. 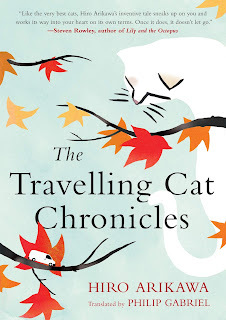 I wanted to properly review The Traveling Cat Chronicles (TTCC) like I did in the past, but then I stumbled across a REALLY nice piece by Lynne Truss, found in The Guardian (2017). I urge you to read that highly readable piece by Truss. I've thoroughly enjoyed her talking about Nana the stray cat (the protagonist) and Satoru, the young man who eventually became Nana's owner, and how they embarked on an unforgettable journey together in Satoru's silver van. Hiro Arikawa’s bestselling Japanese novel features a cat with a heart, who feels loyalty and gratitude and would never abandon his loving human master. I was crying and sobbing so badly at the end, my eyes were swollen for days. Satoru and Nana's story made me miss my own cat (adopted from SPCA). Because of my relocation to Singapore, I couldn't take her with me. No landlords in Singapore would allow pets. One of my best girlfriends—bless her!—adopted my darling girl. I'm happy to know she's now enjoying life with senior cat, Charlie, and her new mom. I jotted down many notes from TTCC and there's one particular one that stood out to me. It touches me deeply, and Truss noted it as well. Nana is a very cool stray cat and Satoru is a wonderful man who loves cats. I was listening to the audiobook borrowed from the library, and I must say Nana sounds very British although he's from Tokyo. Whatever it is, I loved this book to bits.